No need to squint at your music anymore! Six energy-efficient LEDs cast bright white light over your music, and the sliding switch controls two brightness settings. 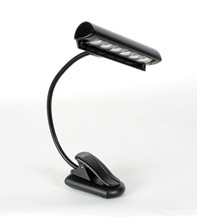 The sturdy clip firmly grips music stands, and the flexible gooseneck holds the light firmly in place. Durable travel bag included! Powered by 3 AAA batteries or the included AC adapter.